Accountability Lab is a recipient of our 2015 Feedback Fund. Recently they shared these insights with us. In April of 2015, twin earthquakes in Nepal killed over 8,000 people and displaced almost 3 million more. Accountability Lab and Local Interventions Group mobilized our youth networks into what we called Mobile Citizen Helpdesks. These helpdesks of 5 to 10 volunteers worked with communities across the 14 worst affected districts to gather immediate feedback from victims on the relief efforts, and close the loop on the disaster response. People were confused and uninformed. False rumors abounded around everything from when the next earthquake would strike to how much they could receive in compensation to rebuild their lives. These rumors undermined the recovery effort. We launched the OpenMic project with Internews, to track, monitor and debunk rumors in communities through weekly information bulletins combined with local radio shows and community meetings with government officials to discuss the findings. Over 30 reports and interactive briefs have also been disseminated to the government, donors and media to support a better targeted response. We see some encouraging signs – local radio stations are creating entire media content based on them and relief agencies are adapting programs to deal with rumors. With Feedback Labs and Global Giving’s Feedback Fund, we set out to see whether this information was being fed back to communities (what we call “closing the loop”). Was this making a difference vis-à-vis other communities that did not have access to the OpenMic project? We’re working with two different, severely affected communities in the Gorkha district of Western Nepal – Bungkot and the more remote Namjung – in different ways. In Bungkot, we have been supplementing our OpenMic rumor tracking bulletins with local FM radio shows and information gather from community meetings every week to provide a platform for citizens to talk about this information with government officials. They have also been given access to a SMS short-code to report their grievances for free through text message. This is our intervention to provide information. In Namjung we merely track rumors without issuing bulletins, engaging local radio, or SMS broadcasting. Resources don’t allow us to work in both places, so we have a natural experiment. This is the “control group,” or non-intervention group. We’re currently comparing both communities. Bulletins, radio programs and community meetings work in Bungkot and are the main way that citizens are able to debunk rumors and receive accurate information on the earthquake response. They use this data to dispel rumors. To give one example, in late January 2016, a rumor was circulating that those individuals who received NGO grants would be ineligible for government grants for reconstruction. 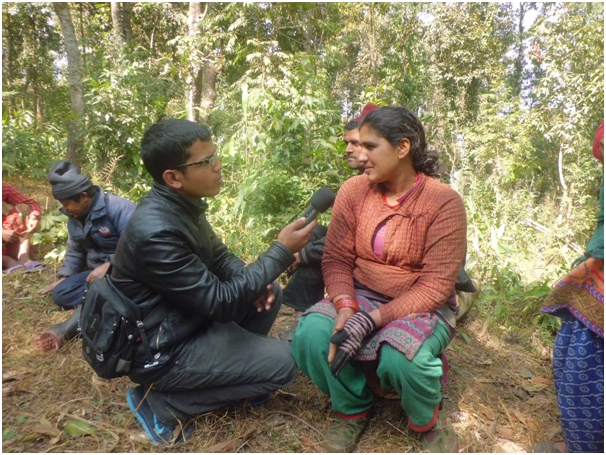 The community meeting in Bungkot also raised this issue, but local government officials at the meeting and our public service announcement broadcast on Radio Gorkha clarified that this was not the case. The SMS platform hasn’t worked – use has been low and we are trying to determine whether it is a lack of awareness of the platform that has hindered citizen participation, or something else. We were not sure what elements of the OpenMic project were most critical to success and why. We’ve tightened how we will respond in future disasters and won’t allow so many variables, as we did this time around. Feedback is about building trust between decision-makers and citizens, as the story of what happened in Namung shows. Citizens had very little access to information and little interaction with government officials. Without face-to-face meetings with officials it seems to be hard for them to close the loop on problems, as we might expect. As a result, negative rumors have led to significant challenges that are diverting resources and energy away from citizen-oriented solutions. For example, a particular rumor was circulating that if families registered as separated or divorced they could receive 2 household grants instead of one- which was false. As a result, the National Reconstruction Authority is now struggling to establish which families are actually separated and which are simply acting as such to receive the additional money. This underscores the importance of citizen voice in the humanitarian response, both in Nepal and beyond. Accountability Lab is a GlobalGiving organization that Listens, Acts, and Learns.